Music fans are likely especially happy on this fine Friday, and not just because the weekend is finally here. Drake dropped his long-anticipated album Views (formerly known as Views From The 6) and it reads like a playlist of rap's biggest heavy hitters — the album features collaborations with Rihanna, Mary J. Blige, and Future, just to name a few. But there was one notable (and seemingly last-minute) change made to the Views track list that might raise some eyebrows: "Pop Style," which was released as a single not even a month ago featuring Kanye West and Jay Z, is on the album as a solo track. So why did Drake cut West and Jay from the album version of "Pop Style?" Before fans jump to the obvious conclusion of a feud between Drake, West, and Jay, it's important to look at the long history between these guys. West and Jay have always gone together like peanut butter and jelly — they've always seemingly had each other's backs, have been longtime collaborators, and have never publicly feuded, despite tabloid rumors suggesting a feud between their spouses, Beyoncé and Kim Kardashian. But adding Drake to the mix brings a little ambiguity, which could explain the song's change. It was a lack of communication paired with natural competitiveness. When something monumental is happening in front of me and everyone's paying attention to that, you gotta say, "I'm still here." But those two are gods to me. Calling them "gods" is certainly pretty high praise. Furthermore, Drake said of West specifically, "Kanye and me are friends; we're plotting on getting some work done together." 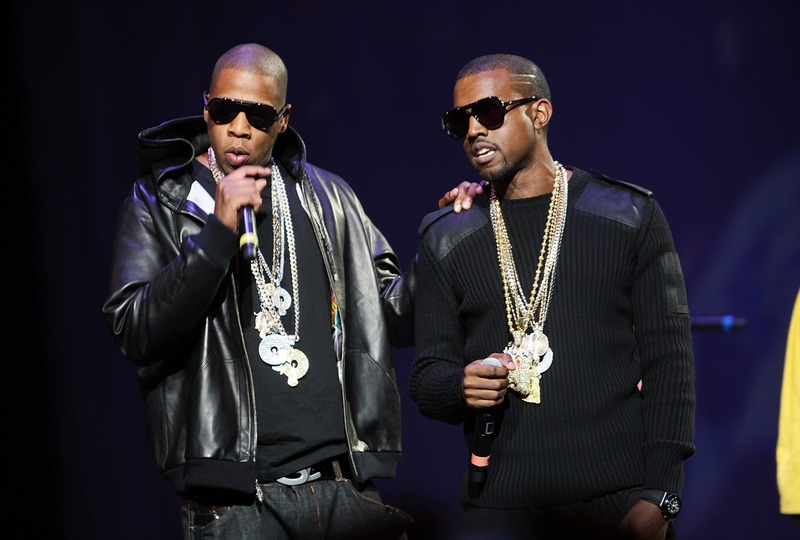 He then seemingly dissed Jay's inclusion of art references in his music by saying, "It's like Hov can't drop bars these days without at least four art references! I would love to collect at some point, but I think the whole rap/art world thing is getting kind of corny." Hmmm... well, OK. Jay responded, naturally, via song lyrics. In 2014's "We Made It," he rapped, "Sorry Mr. Drizzy for so much art talk/ Silly me rappin' 'bout sh*t that I really bought/ Why these rappers rap about guns they ain't shot?/ And a bunch of other silly sh*t that they ain't got." We live up the street from each other. I’ll pull up at his house and see what he’s doing. We’ll just sit and collaborate, that’s what music is all about. ‘Ye is one of my favorite people. Period. In the world man. I love ‘Ye. I grew up with him as a role model, he is part of the reason I am here right now. Jay didn’t really do a verse. I was just trying to get 'Ye on at it first. 'Ye sent it to me like that, like, "yo, Jay kinda just did my first few lines for me and he was just here, and that’s how we flexed it" and it was cool, and he was all excited about it, like "yo put The Throne on it, it'll be a crazy moment" and of course, people just wanna hear Jay Z rap but... I was just having conversation with Kanye — that just landed in my lap, so I just dealt with it accordingly. It didn’t exactly play out how I would've wanted it to as far as business or whatever goes, so I just figured it would just be easier to go with my version. Listen, I've expressed my admiration and respect for Jay countless times — that'll never change. Sometimes [Jay Z and I] just fall on opposite sides of the spectrum when it comes to the rap world... It’s always mutual respect but sometimes it has to be from afar due to other situations that really don't have anything to do with me and him. It seems like Drake wanted West on the song, and got more than he bargained for when Jay joined for a few lines. It's also telling that Drake has released Views exclusively to Apple Music, choosing not to release it to Jay's music streaming service TIDAL. It certainly seems like Drake has respect for Jay, but prefers to keep their relationship at a distance. Either way, music fans can respect and enjoy all three of them, which is exactly what I predict Drake, Jay, and West would want.